Masonite HD steel offers superior strength combined with the elegance of decorative Woodbridge Glass in the Nickel Half Lite Steel Entry Door. The Woodbridge Glass design enhances both the appearance and value of your home without compromising security or privacy. Durable high-definition panels offer excellent shadow lines for added architectural interest. The entry system features a primed 4-9/16" wood door frame that's ready to paint. Door and frame are supplied primed, ready to paint. Door unit fits a rough opening of 36-1/2 x 82"
The DreamLine Linea Mira, part of the Platinum Linea collection, is a single panel, walk-in shower screen, with a modern and unique design on both sides. The full-length mirror effect makes this panel indispensable for comfort and convenience in any bathroom. DreamLine exclusive MirrorMax technology is used to create the bold design, adding a splash of sophistication and luxury to any space. ClearMax glass coating provides superior protection from stains and is nearly maintenance-free. Stanley Doors helps you create an entrance that is an extension of your unique personality. Our products offer lasting, elegant entryways with an emphasis on style, security and, energy efficiency. Energy Star<sup></sup> certified and double bored, the door can accept a lock and deadbolt of your choice. A delicate silkscreen floral pattern creates a highly decorative effect in this creative Silkscreened Glass Series. In addition to the beauty of our doors, you could be sure that once installed, they are simple to maintain and care for and are backed by Stanley's limited lifetime warranty to boot! Stanley doors is dedicated to manufacturing the highest value products. We are continuously developing and innovating products that will serve you for many years. Welcome home. When only the utmost in sophistication and security will do, the Blacksmith design combines a tempered, acid etched back glass with intricately detailed ironwork. The result is a stunning decorative glass that is both beautiful and secure. These durable steel 34 in x 80 in pre-hung entry doors will enhance the value and beauty of your home. Double bored, the door can accept a lock set and deadbolt of your choice. PLEASE ALLOW 2-3 WEEKS FOR DELIVERY AS THE DOOR IS CUSTOM MADE. 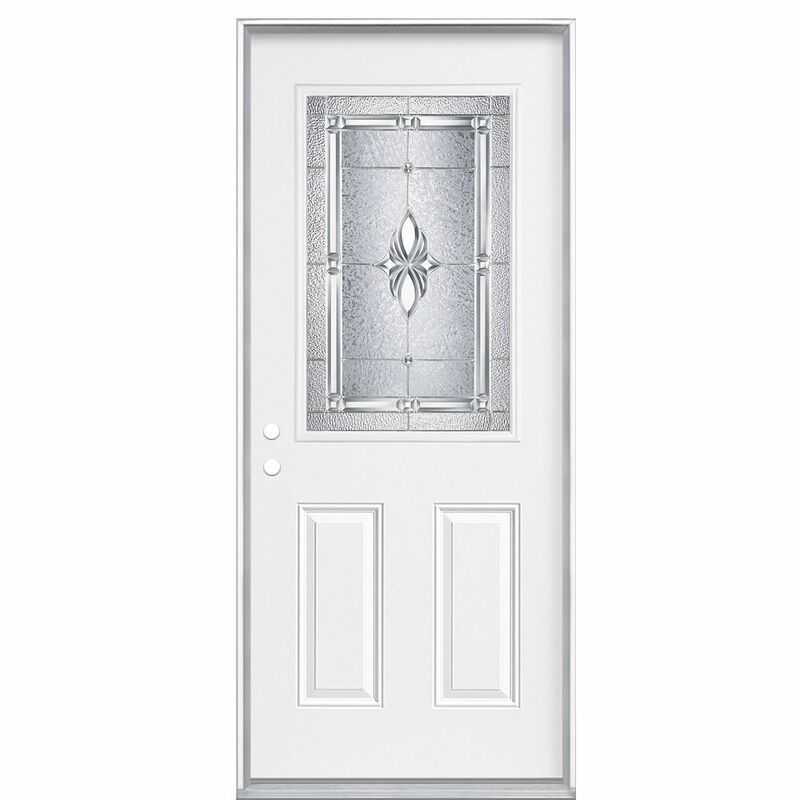 34-inch x 80-inch x 4 9/16-inch Nickel 1/2-Lite Right Hand Entry Door - ENERGY STAR® Masonite HD steel offers superior strength combined with the elegance of decorative Woodbridge Glass in the Nickel Half Lite Steel Entry Door. The Woodbridge Glass design enhances both the appearance and value of your home without compromising security or privacy. Durable high-definition panels offer excellent shadow lines for added architectural interest. The entry system features a primed 4-9/16" wood door frame that's ready to paint.